Reprints available directly from the publisher. Gordon and Breach Science Publishers SA. Experimental astroplates HT-IA were tested. It is shown that a good approximation to the Johnson-Morgan photometric band B can be obtained with a plate + glass filter combination. We have estimated the limiting magnitude for the stars on one specific plate. Unsensitized astroplates HT-1A with very fine granular quasi-T-crystal emulsion are produced by the Photoemulsion Laboratory of J.S.Co. SLAVICH in Pereslavl-Zalessky, Russia. An experimental batch of these plates was obtained by the Sternberg Astronomical Institute (SAI) for sensitometric and spectral analysis. In this work we compare the spectral sensitivity of plate + filter BS-8 (Russian glass, 3-mm thickness) combinations to the Johnson-Morgan photometric band B. The experimental samples of these plates were hypersensitized by T.A.Birulya in the SAI photolaboratory by bathing the plates in a hydrogen atmosphere for 75 minutes at temperature of 560°C and pressure of 1 atm. The plates were exposed for 10 min on the 250-mm, F/3.5 Maksutov camera of the Moscow Observatory of SAI in September 1992 by A.Burlak, G.Moshkin and D.Volod'ko. Three images of a photometric standard in the open cluster IC 4665 were obtained. 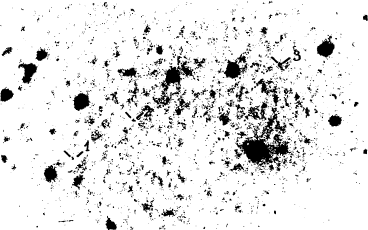 The photometric magnitudes of 39 standard stars were taken from Johnson (1954). The standard stars were measured by the iris-photometer of SAI. Δm = (0.0067 ± 0.0215)( B - V ) + (0.017 ± 0.014), the standard deviation is σΔm = 0.m06. 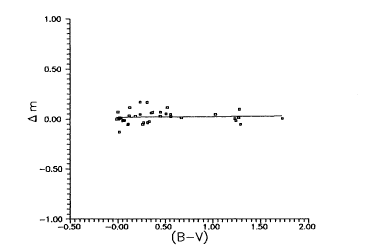 Johnson magnitudes against the colour indices B - V. The line represents the least squares fit. Figure 2. The region of the globular cluster NGC 6205. The faintest stars are marked (see text). We conclude that there is no systematic colour-dependent difference between the instrumental and standard magnitudes and the instrumental system obtained is very close to the standard Johnson-Morgan B-band. For illustration of the sensitivity properties, we have estimated the limiting magnitude of the image of the globular cluster NGC 6205 on our plate. This image was obtained on a plate of the same batch, using a 500-mm, F/4 Maksutov camera from the Crimean laboratory of SAI in July, 1992, by A.Martis and D.Zhukov. This plate was exposed for 60 min and then was developed for 7 min in a UP-2 developer. We thank T.A.Birulya, A.Burlak, G.Moshkin, S.Shugarov, D.Volod’ko and D.Zhukov for their help and Prof. P.V.Sheglov for a useful discussion. Baum, W.A., Hiltner, W.A., Johnson, H.L., and Sandage, A.R. (1959) Ap. J. 130, 749. Johnson, H.L. (1954) Ap. J. 119, 181.